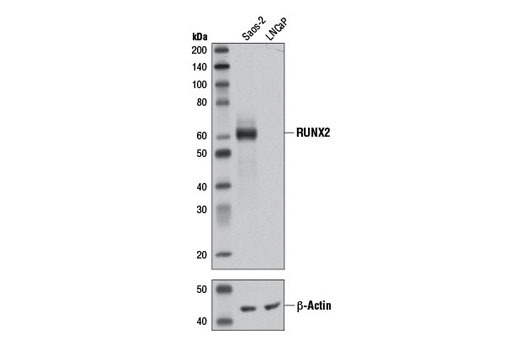 Western blot analysis of extracts from Saos-2 and LNCaP cells using RUNX2 (D1L7F) Rabbit mAb and β-Actin (D6A8) Rabbit mAb #8457. Immunoprecipitation of RUNX2 from Saos-2 cell extracts, using Rabbit (DA1E) mAb IgG XP® Isotype Control #3900 (lane 2) or RUNX2 (D1L7F) Rabbit mAb (lane 3). Lane 1 is 10% input. 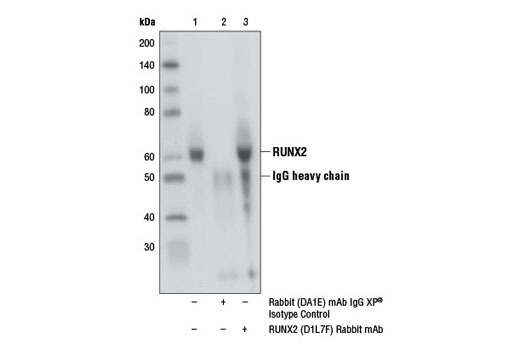 Western blot analysis was performed using RUNX2 (D1L7F) Rabbit mAb. 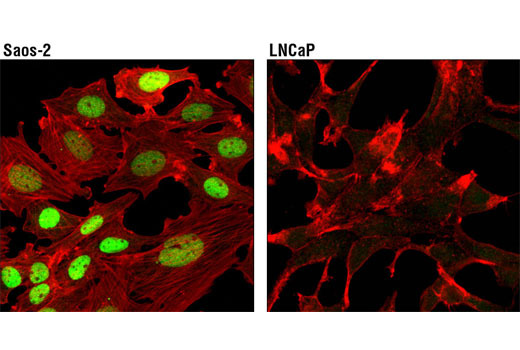 Confocal immunofluorescent analysis of Saos-2 (left) and LNCaP (right) cells using RUNX2 (D1L7F) Rabbit mAb (green). Actin filaments were labeled with DY-554 phalloidin (red). Flow cytometric analysis of LNCaP (blue) and Saos-2 (green) cells using RUNX2 (D1L7F) Rabbit mAb. Anti-rabbit IgG (H+L), F(ab')2 Fragment (Alexa Fluor® 488 Conjugate) #4412 was used as a secondary antibody. Chromatin immunoprecipitations were performed with cross-linked chromatin from Saos-2 cells and RUNX2 (D1L7F) Rabbit mAb, using SimpleChIP® Plus Enzymatic Chromatin IP Kit (Magnetic Beads) #9005. DNA Libraries were prepared using SimpleChIP® ChIP-seq DNA Library Prep Kit for Illumina® #56795. 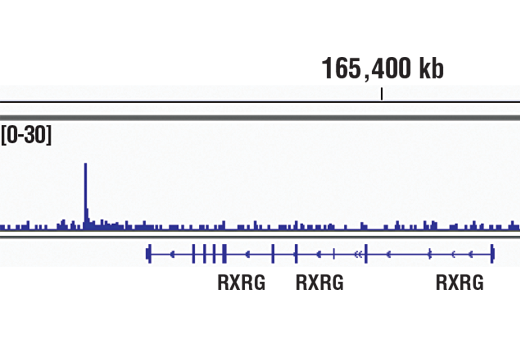 The figure shows binding across RXRG gene. For additional ChIP-seq tracks, please download the product data sheet. Chromatin immunoprecipitations were performed with cross-linked chromatin from Saos-2 cells and either RUNX2 (D1L7F) Rabbit mAb or Normal Rabbit IgG #2729 using SimpleChIP® Enzymatic Chromatin IP Kit (Magnetic Beads) #9003. The enriched DNA was quantified by real-time PCR using human RUNX1 Intron 1 primers, SimpleChIP® Human RUNX2 Promoter Primers #12376, human FRA10AC1 intron 1 primers, and SimpleChIP® Human α Satellite Repeat Primers #4486. The amount of immunoprecipitated DNA in each sample is represented as signal relative to the total amount of input chromatin, which is equivalent to one. 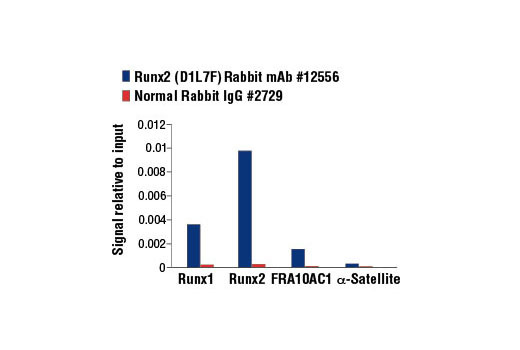 RUNX2 (D1I7F) Rabbit mAb recognizes endogenous levels of total RUNX2 protein. Monoclonal antibody is produced by immunizing animals with a synthetic peptide corresponding to residues surrounding Ala273 of human RUNX2 protein. Runt-related transcription factor 2 (RUNX2) is a member of the RUNX family of transcription factors. It is involved in osteoblast differentiation and skeletal morphogenesis. RUNX2 regulates the transcription of various genes, including osteopontin, bone sialoprotein, and osteocalcin, via binding to the core site of the enhancers or promoters (1-3). RUNX2 is crucial for the maturation of osteoblasts and both intramembranous and endochondral ossification. Mutations in the corresponding RUNX2 gene have been associated with the bone development disorder cleidocranial dysplasia (CCD) (4-6). RUNX2 is also abnormally expressed in various human cancers including prostate cancer and breast cancer. It plays an important role in migration, invasion, and bone metastasis of prostate and breast cancer cells (7-10). Viereck, V. et al. (2002) J Cell Biochem 86, 348-56. Willis, D.M. et al. (2002) J Biol Chem 277, 37280-91. Tu, Q. et al. (2008) J Cell Physiol 217, 40-7. Quack, I. et al. (1999) Am J Hum Genet 65, 1268-78. Cardoso, B.M. et al. (2010) Clin Dysmorphol 19, 150-2. Han, M.S. et al. (2010) J Cell Biochem 110, 97-103. Akech, J. et al. (2010) Oncogene 29, 811-21.
van der Deen, M. et al. (2010) J Cell Biochem 109, 828-37. Barnes, G.L. et al. (2003) Cancer Res 63, 2631-7. Barnes, G.L. et al. (2004) Cancer Res 64, 4506-13.